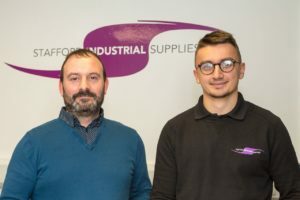 Long-established protective clothing and workwear supplier Stafford Industrial Supplies (SIS) Ltd are entering a new growth phase after bolstering its management team and gaining quality management qualifications. Jake Chadwick has joined the team as Operations Manager, Garedd Duncan has achieved Director status and Ted Valentine has joined as an apprentice with the Astonfields Industrial Estate based business. Managing Director Paul Walters says the new structure has freed him to work on business development. SIS Ltd was founded in 1989 and Paul has been with the business since 2001. Paul, a Council member at the Staffordshire Chambers of Commerce, became a Director of SIS in 2008 and bought the whole business in 2010. The business supplies protective workwear, safety boots and footwear, industrial signage, janitorial supplies and personalised, embroidered workwear to companies across Staffordshire and beyond. SIS Ltd boasts state-of-the-art heat printing and embroidery equipment and their knowledge of health and safety at work means they can advise and supply clients with confidence. For media enquiries contact Nigel Howle by email at nigel.howle@howlecom.co.uk or telephone 0776 2043436.